Find the "right" commercial voice over talent for commercial voice overs! Looking for commercial voice overs, voice over talent who specialize in radio, television and Web or Internet commercials? World class voice over talent can be found right here at "Voice Overs Central". We are your one stop voice over talent resource. You can listen and choose the best performers for commercial voice overs from our voiceover demos below anytime. Feel free to call on Marketing Mania to provide you with voice over talent auditions so you can choose who fits your project best or simply choose a voice over talent from the voice over demos below. Some uses for commercial voice overs would be: radio voice overs, tv promo voice overs, commercials, infomercials, as well as webmercials. 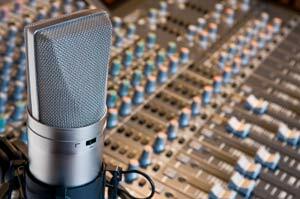 We offer both just the voiceover recording and/or full voiceover production with music and sound effects. We invite you to listen to the commercial voice over demos below, choose and then name your voice over talent selection, or ask for a free voice over casting if you'd like to hear voice over talent below record a portion of your ad in our commercial voice over rate request form. Don't have time for the auditioning process? Simply ask for a recommendation from our casting director. She knows our voice over roster like the back of her hand. We have a FAST turn around!